2018 Real Art Awards recipient Keith Clougherty will present a new installation of works created with and inspired by his Great Aunt Mary. Keith Clougherty practices social sculpture, creating objects, installations, and experiences using his ancestry and the history of land as a starting point. 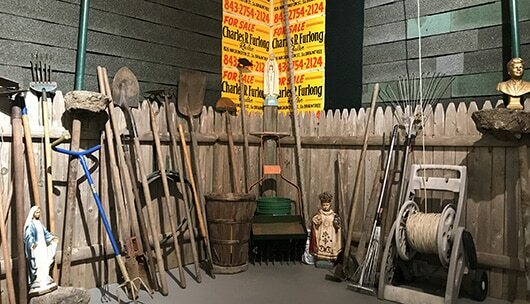 The vignettes in this installation include objects from his Aunt Mary’s house as well as artworks inspired by her life. Clougherty’s work questions our understanding of history by utilizing a blunt approach in exploring the continued effects of colonialism in North America. His work explores topics as broad and varied as elder care, Irish ancestry, economics, ecology, and production. Read an article in the Hartford Courant about Keith’s and Mateo Nava’s Exhibitions. Born in Miami Beach, Florida, Keith Clougherty attended The Design and Architecture Senior High in Miami. During this time he was selected as one of ten Visual Art finalists in the 2009 YoungArts program, a prestigious national competition sponsored by the National Foundation for Advancement in the Arts (NFAA). Keith earned his undergraduate degree from the School of the Museum of Fine Arts at Tufts University. In addition to his art and care practices, Clougherty is a member of The FANG Collective, a group of politically active organizers and community advocates. Working with FANG has helped galvanize his social sculpture to directly address issues like white supremacy, capitalism, and global warming. Keith currently resides in Braintree, Massachusetts.